Another new console and another arcade style shoot ‘em up. Xbox 360 had Geometry Wars, PlayStation 3 had Super Stardust HD, and now the PlayStation 4 has Resogun. Available for $14.99 from the PlayStation store or free for PlayStation Plus members, Resogun succeeds in being a fun game that is worth playing, though a lack of game modes and barebones multiplayer prevent it from fully reaching its potential. 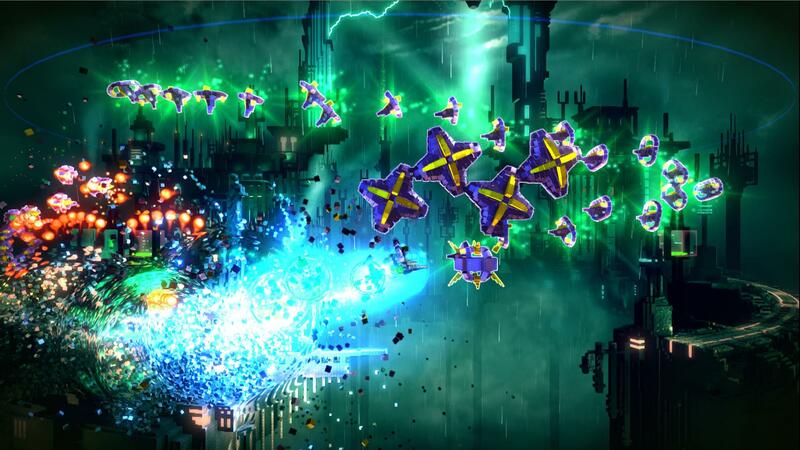 Resogun doesn’t waste much time on silly tutorials. Like the games of yesteryear, the game starts and you just start playing. At the beginning of each level the player is reminded to “save the last humans,” and those few words are both the tutorial and the entirety of the storyline, presented in only a second or two of spoken dialogue. This game is really all about the action, and the second the game starts you will be shooting down waves of enemies that materialize throughout the cylindrical levels and attempting to save the last humans. The question is: precisely how do you save them? Well, the game doesn’t really tell you. There are the briefest tutorial tips which appear without interrupting gameplay in order to teach the player the controls, and there isn’t much to it. Left analogue stick moves the ship, right analogue stick fires weapons either left or right, L1 gives your ship a speed boost and allows you to plow through enemies, R1 activates a powerful overdrive attack, R2 detonates a screen clearing bomb and L2 is used to throw humans you may have picked up. It only takes a few games to get used to the buttons and the game controls like a dream on the Dualshock 4, but even after learning the controls, many of the gameplay mechanics remain a mystery. 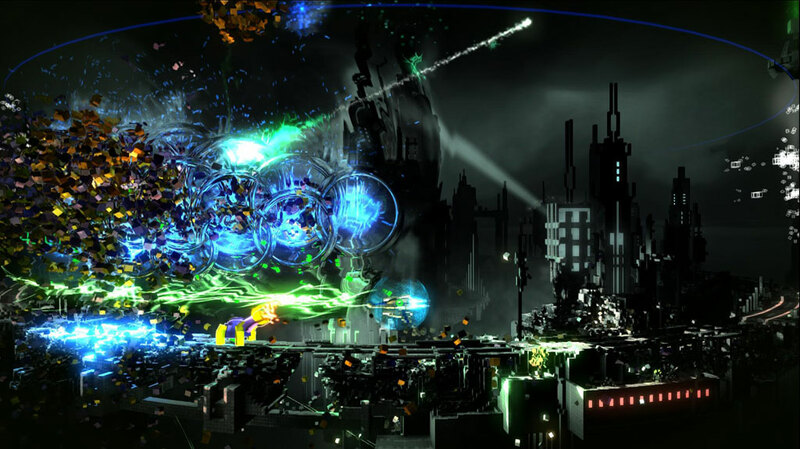 Instead of telling the player exactly what to do, Resogun guides the player with color and occasional warnings when something bad is about to happen. For example, once in a while you will hear a notice that’s says, “Keepers detected.” At first I had no idea what that was all about, and just kept shooting everything in sight. Once in a while I’d notice a human running around thanks to a pillar of green light that appears above any humans that can be picked up, and then I saw another green light with arrows pointing to it, and I discovered that I was supposed to take the humans to that location to save them. Eventually I began to associate, “Keepers detected,” with the appearance of a savable human. After getting used to the game, I finally noticed a green glow that appeared around certain enemies. Turns out, those were the Keepers, and destroying an entire group of them releases one of ten savable humans from a random box somewhere in the level. So that’s the flow of the game: destroy Keepers, pick up the human, deliver it to safety and get back to shooting at things. Of course, it’s not always easy to save the humans. If a human is released from its box, it will wander about until you pick it up, but if you wait too long you will hear, “Human in danger,” and an enemy ship will pick it up and fly away with it. If the ship gets away, you hear, “Human lost,” and that’s the end of that poor human. Ideally you will be able to rescue the human before that ship even appears, but sometimes more than one group of Keepers appear at a time, turning the game into a bit of a juggling act, literally. When you pick up a human, you can throw it a short distance, or a bit further if you do so while boosting, but you can only pick up one human at a time, so prioritizing the right human or group of Keepers is essential if you want to rescue all of the humans. And though your weapon cannot harm the humans, it does launch them in to the air, so you have to be careful that you don’t knock them into any pits or liquid hazards like water or lava. Making things a bit more difficult are Keepers that must be defeated in a specific order; otherwise, the human will immediately die in its box. The first dozen or so times I encountered these Keepers I had no idea why I kept hearing, “Human lost,” without warning. But once again, I just had to pay closer attention to the details to find the solution. When you encounter these Keepers, the specific target you have to kill first will be surrounded by a green circle, and after you destroy it, that circle will move to the next target and so on. Unfortunately, sometimes the Keepers appear unexpectedly and you might immediately kill the wrong one before you even realize they have to be killed in order, and there’s really nothing you can do about that. There are also Keepers that roll onto the map attached to a green line that forms a circuit. Once the keepers go around the circuit once they then leave the map, and if you don’t destroy them before that happens, you can say your farewells to another helpless human. If multiple groups of Keepers appear simultaneously, you should always find and destroy this type of Keeper first. Even after I got used to all of these mechanics, I was still losing the occasional human without any warning whatsoever. No, “Keepers detected,” or anything; just a completely spontaneous, “Human lost.” Turns out, at some point in the level a human will be released from its box if you happen to have a high enough score multiplier going. If your multiplier is too low, the human just dies. Either way, it’s confusing. If the human is released, this is the only case in which that can happen without hearing, “Keepers detected,” so you might not even notice the human walking around until it’s too late, and if it dies, it really doesn’t make sense to the player at all. While most of the mechanics can be learned intuitively, this one didn’t make sense to me until I started asking around on forums, so I hope the developers address this issue in a patch. On the other hand, there are tons of visual and auditory queues to help the player keep track of things. Good things are almost always green, and the most dangerous things are bright reds, yellows, oranges and purples. To make things a bit easier, a green arrow appears around your ship that points in the direction of the closest freed human. And aside from all of the spoken warnings, there are clear sound effects that the humans make which the player can start to recognize. By paying close attention to the human sounds, I started to notice when that one human was released from its box due to my high multiplier, and I was finally able to save all 10 humans in a single stage. There is also a handy heads up display that shows not only how many lives and bombs you have, but also a set of silhouettes for the 10 humans. They start out as while outlines, but fill in blue and start flashing when Keepers have spawned, and then turn green when the human is released from its box. Once rescued, the icon stops flashing and turns solid green. But if a human is picked up by an enemy ship, the icon turns yellow and eventually red when the human dies. Another part of the heads up display which I didn’t even notice after several games was the boost and overdrive indicators. These appear as two small curved bars that form a circle around your ship. The blue bar above your ship represents your boost ability, and it can only be used when the bar is full and faded out. Activating boost propels your ship forward as long as you hold down L1, and you will destroy any enemies your ship comes in contact with while boosting, and at the end of the boost, your ship will set off a nova that destroys nearby enemies and projectiles. After boosting, you will have to wait for the now faded in bar to fill up before using another boost. There is also a subtle sound effect that indicates when you can boost again which I found much more useful than the actual display. You are invulnerable while boosting, so using it carefully can greatly increase your survivability. The green bar below your ship fills up as you collect small green cubes that appear when you destroy enemies. Once the bar is full, you will hear “Overdrive charged,” and can activate the ability. Unlike bombs, which destroy nearly everything in the entire level in an instant, the overdrive is a powerful beam attack that you can use to wipe out nearby enemies. Between overdrive, boosts and bombs, there are a ton of ways to get out of trouble, and mastering when to use them—boosts especially—is essential to becoming a good player. You also have to pick the right ship. There are three ships in Resogun, and one of my favorite things about the game is how different each one plays. They are unique enough that you have to approach the challenges throughout the game appropriately to utilize their strengths and compensate for their weaknesses. The first ship, Ferox, is pretty basic and worthy of being the “default” ship. It has strictly average abilities, including average speed, an average boost and an average overdrive. It shoots its projectiles in straight lines and as upgrades are picked up during gameplay, its power increases and additional projectiles are fired, slightly increasing the width of its attack. 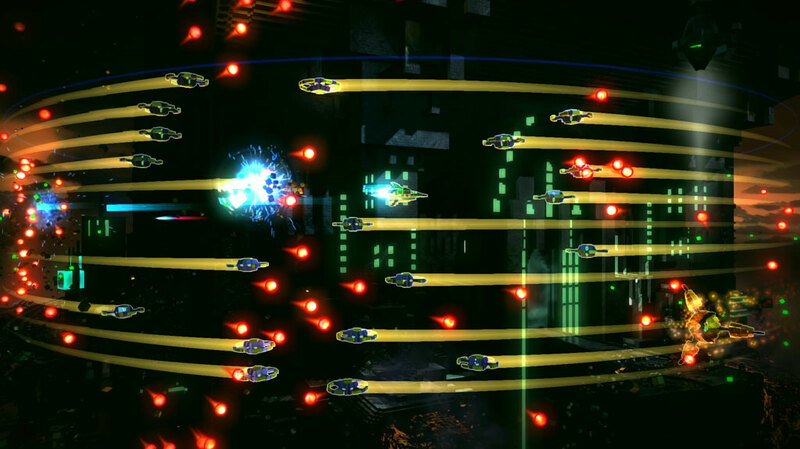 The range of these attacks are quite high, so Ferox is great for defeating enemies at a distance and wiping out groups that have tight formations, but is weak to enemies that fill up all of the vertical space throughout the stage since it has no way of defeating them without moving so that the enemies are positioned directly in front of the ship. Then there’s Nemesis, everybody’s favorite ship (or at least mine). As the fastest ship in the game, Nemesis can weave through enemy waves easily and can activate its boost more frequently and for longer than any other ship. The downside to all of this is the power of its weapon. Bosses will take longer to kill, and even some basic enemies will be able to absorb a surprising number of hits before they are defeated. Nemesis also has the weakest overdrive in the game. But if the player can properly utilize Nemesis’ boost, the enemies will be crushed in an instant. Still, you’re going to have to fire a few shots at some point, and though Nemesis has the weakest weapon, it is also capable of defeating enemies in any direction. Its basic attack starts out simple, but eventually spreads out as it is upgraded. The best part is the homing missiles, which can hit enemies no matter where they are. This unique feature of Nemesis makes it the easiest ship to use and learn. Finally there’s Phobos, the slowest and most difficult ship to use in the game. Its lack of speed makes it difficult to avoid enemies and projectiles, and its boost recharges slowly. Even its basic attack fires infrequently and has a limited range! But it’s not all bad news. Phobos may be slow, but it is also the most powerful ship in the game. No ship is better at destroying bosses, and nearly every basic enemy can be destroyed within a shot or two. Its weapon doesn’t seem like much at first, but when it hits an enemy, the attack splits off and hits additional enemies behind the first one. Phobos cuts through dense groups of enemies and rows with ease, and when things get really crazy, it has the strongest and most long lasting overdrive in the game. No matter which ship you decide to use, playing through Resogun is a lot of fun. The first level, Acis, is appropriately easy, and gives you plenty of time to get used to the controls and to stop and smell the roses. 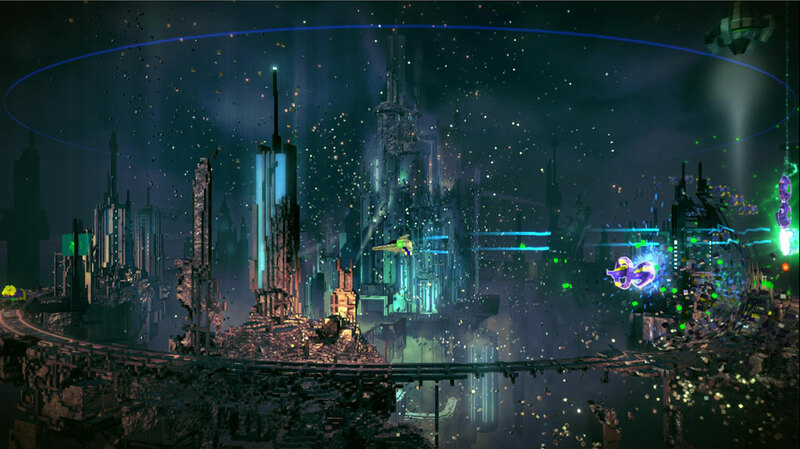 Resogun looks fantastic. Everything in the game is made up of countless tiny blocks, so as the destruction unfolds, these blocks rain all over the levels. It’s glorious, and an enjoyable example of what the PlayStation 4 is capable of. Could this game have been on last gen consoles? Of course it could have. But would it have looked this pretty? Not a chance. The longer you survive on a stage, the more destruction surrounds you. Bigger waves of enemies with more aggressive attack patterns and projectiles start to spawn, and the world around you begins to crumble. In Acis, as enemies are destroyed and as more and more explosions go off, the buildings in the background start to fall apart as well. By the time you defeat the boss of the stage, the entire level explodes into millions of tiny boxes. It’s pretty awesome to look at, I’ve got to say. The other four stages—Ceres, Decima, Febris and Mefitis—are each significantly more difficult than the levels that come before, so there will be progressively less and less time to spend appreciating the background. Ceres and Decima aren’t that bad, but the difficult really picks up with Febris and especially the last level, Mefitis. My first time playing through Mefitis was quite pathetic indeed. But through practice and patience, it all starts to make sense. As I mentioned before, learning to properly utilize boosts for their destructive power and for getting out of trouble is essential, and picking the right time to use overdrives and bombs is important as well. With enough practice, it doesn’t matter if hundreds of enemy ships are all converging upon you with their projectiles blanketing Mefitis, you can find a way to survive. Even the boss battles become second nature. Each of them has a particular pattern that you can get used to, and though you may fail on your first couple of attempts, they eventually become just another part of the level. On higher difficulties, the bosses are significantly more challenging, but I didn’t find them to be any more difficult than the rest of the game. Even the boss of the game, which initially seems overwhelming, can be defeated easily once its patterns are understood. Once it all starts to click, it isn’t long before the credits roll, assuming you played Arcade Mode. All five stages can be cleared by a capable player in less than an hour, though playing through the game on Rookie (easy) or Experienced (normal) provides only a minimal challenge compared to what awaits on Veteran (hard) and Master (very hard). The stages can also be tackled individually in Single Level mode, where you can try to top the leaderboards for each difficulty. But if you want to experience the game’s 5th difficulty, Hero, you’ll have to complete Arcade Mode on Master. If the leaderboards are to be believed, then at the time of this writing, not a single person has yet reached the Hero difficulty. I managed to complete Arcade Mode on Experienced, and I also completed every level on Veteran and a couple stages on Master in Single Level mode. I found the difficulty progression to be appropriate, because though I was occasionally frustrated by my failures, I discovered that every time I tried again I was a little bit better, and that made the game hard to put down. Resogun kept me easily entertained for 10-15 hours just as a solo player. I also enjoyed playing Online Co-Op mode with Ted, which was free of lag and a lot of fun. I do wish the interface would have provided more information about my Co-Op partner’s lives and bombs, but that didn’t stop the fun. It’s just unfortunate that there isn’t more to it than that. Arcade mode, Single Level mode, Online Co-Op and all of the difficulty settings and leaderboards are all that the game has to offer. As a free game for PlayStation Plus subscribers, that is more than enough, but $15 might be too high an asking price for those that are not subscribed. I can’t help but to think of all the various game modes in Geometry Wars: Retro Evolved 2 and how great a value that was for only $10. By comparison, Resogun seems expensive. Still, as a PlayStation 4 launch title, it is a great game for anyone that likes dual stick shooters and shoot ‘em ups. The replay value for those willing to attempt the harder difficulties is significant enough to recommend a buy to those players and also to casual gamers looking for something that is fun and easy to pick up and play. I’d have liked to see more multiplayer options and game modes, but that doesn’t change the fact that Resogun succeeds in being a very entertaining game, and an excellent option for early PlayStation 4 adopters. Ari managed to earn a Platinum Trophy in Resogun after around 10-15 hours of gameplay. His copy of the game was free via PlayStation Plus.